P-38 Mono plug connector can be use with microphones, electric guitars, headphones, loudspeakers, and many other items of audio equipment. P-38 Mono plug connector is a copper plated connector. P-38 Mono plug connector has Precision machined one-piece contacts - avoid hook up of tip contact. 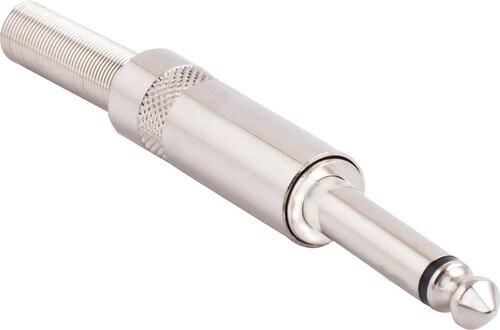 P-38 Mono plug connector Meets all prevailing standards. P-38 Mono plug connector has High quality P-38 male Mono audio connector. P-38 Mono plug connector has Fully machined connector. P-38 Mono plug connector is durable. P-38 Mono plug connector has a fancy look. P-38 Mono plug connector is Easy to install. Naresh Electro Industrial Corporation was incorporated in the year 1983 as a reliable dealer, supplier and trader of Electrical Cables and Wires. Our entire range of products includes PTFE Cables, Thermocouple Cables and Compensating Cables which has earned us a long list of esteemed clients all over the market. Under the Brand name Chetan, ELT, NE, Ganpati, Niko, Neico, Ganpati and Prateek our products are widely acclaimed in diverse industries, hence made available in various sizes and shapes. It is appreciated among customers due to its easy assembly, fire retardant, heat resistance, power efficiency and superior conductivity features. These products are the mark of quality and trendiness. With our unique business polices, dedicated work polices, culture of maintaining quality & excellence in everything, we have established healthy work relationship with various prestigious business associates which has lead us to a new heights and vast client base. Our state-of-the-art infrastructure forms the backbone of organization. With the advent of technologies, we have up graded our infrastructural facility to keep a pace with the ongoing market developments. Thus, with the assistance of our efficient work force and advanced infrastructure, our company has earned remarkable accolades in this domain. Owing to the priority and concerns to serve quality products, we have established an effective system under the supervision of vigil quality professionals to keep a check on the entire production process. In addition to this, we have a spacious and large warehousing unit that helps us to keep our offered range under the safe and secure environment.